Whose Roses Are Those, Anyway? So (I imagine) goes the Rant of the Entitled Gardener. The rose plants she has purchased, planted in her personal patch of paradise, and nurtured lovingly have been rudely pruned by an intruding ungulate. Of course the deer should die. How dare it destroy the private property of a human being? Being trapped, immobilized, stunned with a bolt-gun and having its throat slit (humanely, of course) is too good for it. My roses. My garden. My property. I paid a zillion dollars for this piece of land, I pay a bundle on property taxes every year, so of course it’s mine. My word is law here. No deer, raccoon, bat, bug or microbe can exist here unless I permit it. Right here, where this line is drawn is my property. (Of course, it’s an imaginary line, but never mind that). Right. The soil (which took thousands of years to form), the microscopic organisms that are crucial to its formation, the sunlight, rain and vegetation are all your property, even though you could not reproduce any of them to save your life. Those rose bushes exist by favour of the elements, not because you laid out dollars to acquire them. Last night we had temperatures of -5 C (23 F) with a fierce wind from the northeast. Tonight is calm, but a low temperature of -9 C (16 F) is predicted for our area. This unusually cold weather may kill or damage some of the many palm trees that gardeners have planted here, leaving them brown and sad-looking. Except the ones whose gardeners took the trouble to wrap them in burlap or construct windbreaks. Those things detract from the look of the winter garden, but save the palms to provide that tropicalismo effect next summer. What is the difference between this scenario and that of shrub-nibbling deer? Merely that there is nothing one can do about weather except endure it and take measures to mitigate its effects. So why don’t those gardeners outraged by deer buy some plastic mesh or chicken wire and construct deer-proof structures around vulnerable plants, exactly as the palm-loving gardeners do to get their babies through a cold snap? The difference is attitude — on the one hand, the entitled, short-sighted, intolerant view that seems inherited from the colonial era, and on the other a realistic acceptance of the land on which one gardens. Well, the council of the superlative suburb I call home — Oak Bay, British Columbia — just voted to spend $12,500 (Cdn) to “cull” 25 deer in a pilot project between now and 2015. This means trapping the animals in Clover traps and killing them with bolt-guns to the head. I think this is a crude and ultimately ineffective way to deal with urban deer. This region has thirteen municipalities (13 mayors and councils, folks — think of that!). 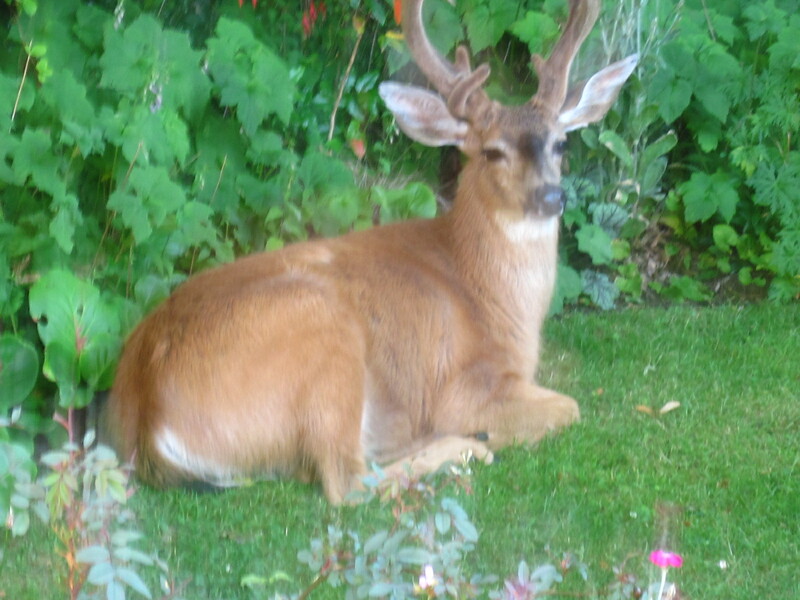 Not all have chosen this option of deer “management.” Saanich, the largest municipality, adjoins Oak Bay; in fact, the boundary between the two runs through the campus of the University of Victoria. 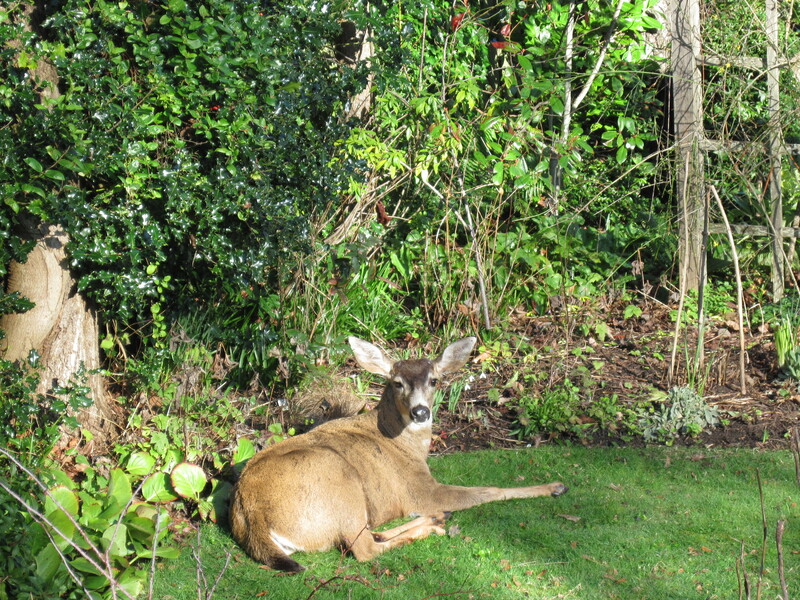 Deer live on the university grounds and in other parts of Saanich, and I doubt that they know where the border is. The 25 animals killed as part of Oak Bay’s pilot project will shortly be replaced from adjoining populations. Aside from the brutality of the methods used, the thing that bothers me is that other, creative options were not even considered. The only question was whether to have a cull. Why not spend the $12,500 on testing fertility control, monitoring deer movements or setting up a way for gardeners to share information about deer resistant plants and plant protection techniques? Why the big rush to kill, rather than taking time to observe, learn and share information? I am a keen gardener. My garden has been visited by deer and sustained a certain amount of damage, but really, it’s not the end of the world. Plants recover, or can be replaced. 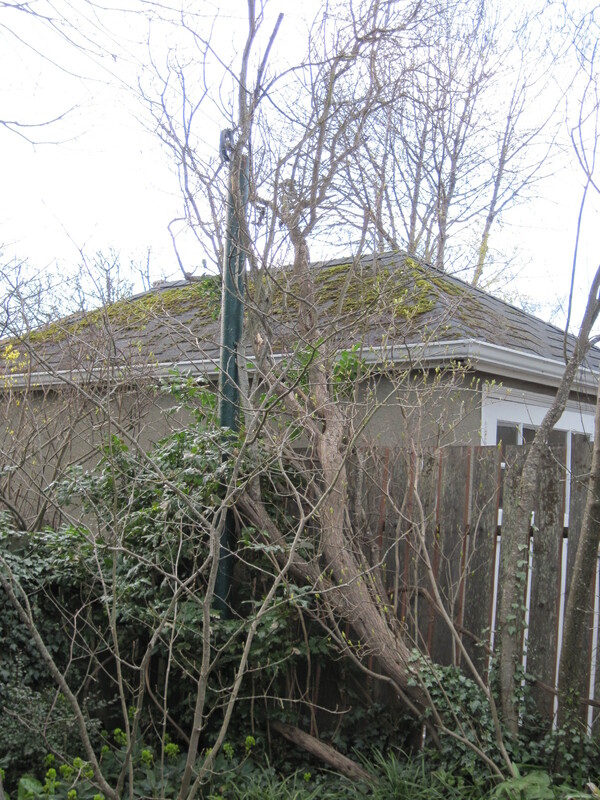 Paying attention and protecting susceptible plants, or setting up simple fencing can make a huge difference. The issue of deer being hit by cars is a misleading one, as though it’s better to kill the animals with bolt guns before they can be hit by cars. Oak Bay is almost 100% residential, with no high-speed roads. The maximum speed limit is 50 km/hr (30 mph), with many streets having posted speeds of 40 or even 30 km/hr (25 or 20 mph). If people insist on speeding or distracting themselves while driving, you can hardly blame deer for the subsequent collisions. Apropos of this, when a resident wanted to put up a warning sign based on her observations of deer using a certain spot to cross a road, she was told this wasn’t permitted. Then there’s the trumped up safety issue — savage deer attacking children and pets. If such an incident had occurred within the borders of Oak Bay, you can be sure it would have received maximum publicity, which has not been the case. There are people (such as myself, for example) who are terrified of finding big white grubs when digging in the garden — complete with adrenaline jolt, panicky little dance and running away screaming — but I don’t expect the municipality to start a grub eradication program on my behalf. 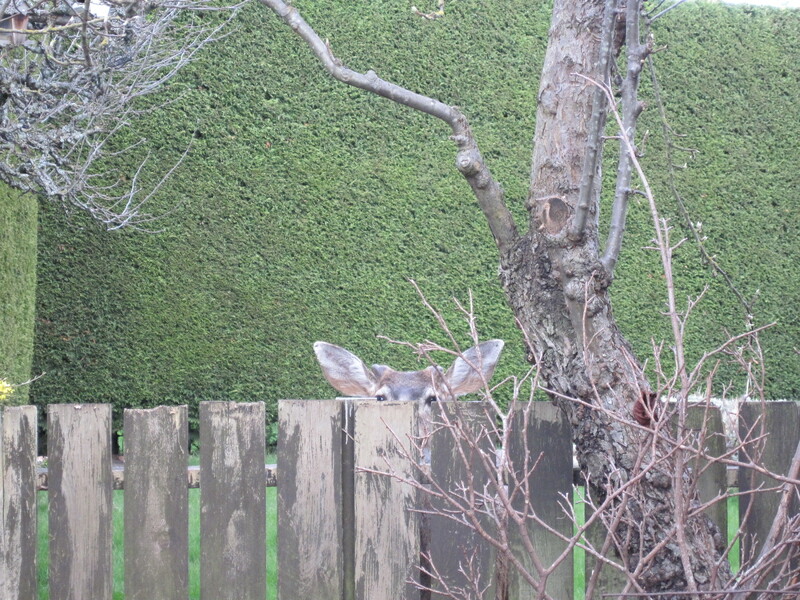 This buck used to hang out in my back garden until I put up some deer netting across his preferred point of entry. I’d rather have him around than guys with bolt guns. Technically, I suppose midsummer is actually the second week in August, but to me August feels like late summer. 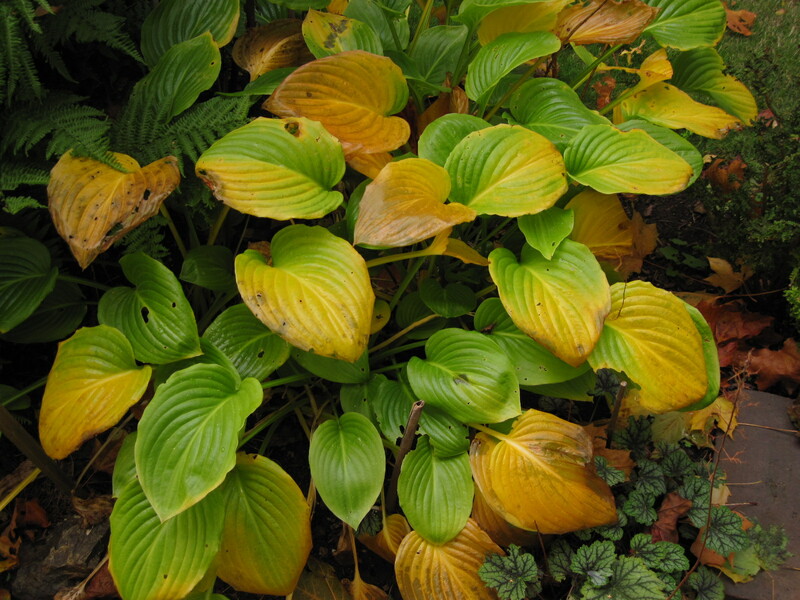 Mid-July is high summer, when the ornamental garden pauses at a peak (hopefully) before starting a decline into its tired, seedy late summer state. Vegetable gardens, on the other hand, at this stage should be showing a promise of harvest. 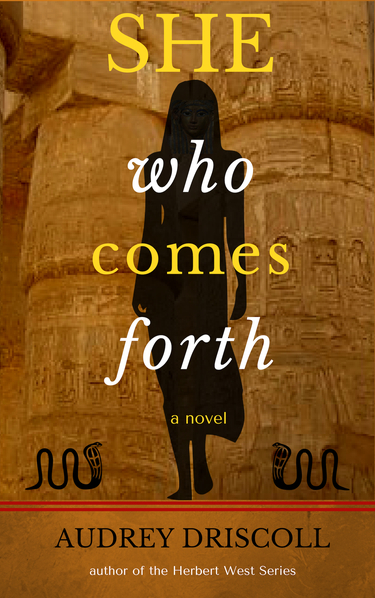 Ha (as Henry Mitchell used to write). I no longer have a vegetable garden, and the tomato plants in their pots do not look promising. There aren’t even any little green tomatoes, although the wretched plants have actually started to bloom. This is amazing when you consider that they spent the last few weeks swathed in a set of old lace curtains, looking a bit like wistful brides whose grooms have failed to show up. I resorted to this rather desperate measure after I realized that the neighbourhood buck (or some other visiting deer) has a taste for tomato foliage. Deer, whether a single one or several, have certainly made their presence felt this summer. I don’t think they come here for their main course, but definitely for dessert or appetizers. Flower buds are a favourite. Lilies were ignored until they formed visible buds, at which point “Golden Splendor” was quite thoroughly disbudded. Granted, it hadn’t been as vigorous as in former years (when it had more than 30 blooms), but an early count promised about 20. Now there are only two buds left, because I swathed them in lace as well. No daylilies will bloom here this summer, or Phygelius either. Hosta buds have been nipped, and even the small, dark red flowers of Potentilla atrosanguinea have been sampled. Ditto alstroemerias. The big blue hardy geraniums, Geranium pratense, bloomed well, but have since lost most of their leaves to the visiting ungulate. The funny thing is that a casual glance over the garden fails to reveal these losses. 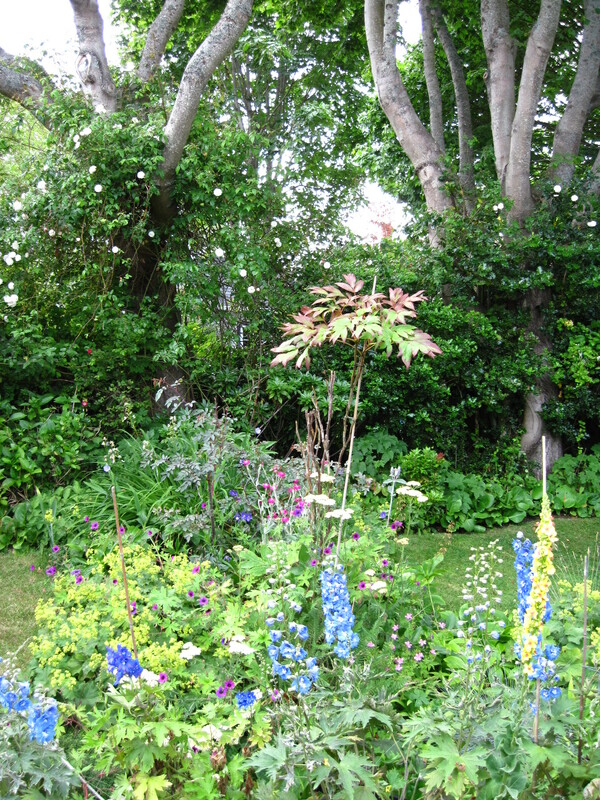 Because of the cool, damp spring, things still look pretty lush, and the tough plants, knowing a good season when they feel one in their tough little tissues, are revelling in it. Only the gardener knows for sure that all is not well. The gardener, these days, is run off her feet doing things only slightly related to gardening, namely painting a new gate, an old gate and a set of refurbished porch steps. The first step, of course is priming, with an oil-based primer that has left leprous-looking spots all over my hands. But while applying this stuff to the new gate, which also includes an arch, I’ve been considering what clematis to plant as an arch-adornment. I’m thinking that Clematis viticella “Julia Correvon” might be the one, or perhaps some other member of the viticella group, because tree roots are a problem in this spot, and the viticella clematises are reputed to be fairly tough. But I have a few more months to think about this before planting time next spring. 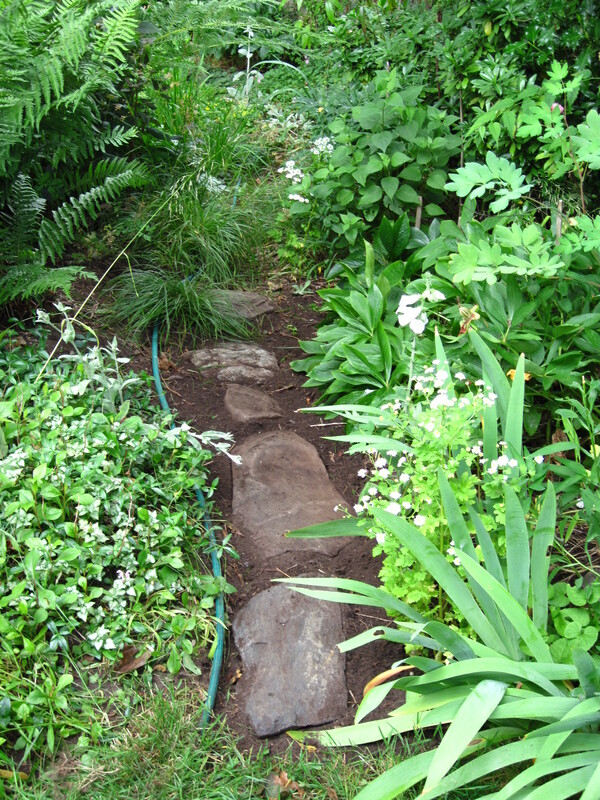 Another recent worthwhile garden project was lifting a set of stepping stones from under accumulated soil. I’m still amazed that I lost sight of them to the point that they had to be dug up and reset. Now that they are visible once more, the path they demarcate looks mysterious and inviting once more. And the weather? Well, we had a taste of summer for the last week or ten days, with temperatures in the mid-20s (mid 70s in Fahrenheit). But after a doozy of a thunderstorm on Friday night, things reverted to cool and damp — just in time for the painting project. C’est la vie.